Plastic wrap - BENKAI Co.,Ltd - BENKAI Co., Ltd. Plastic wrap was first made from PVC, which remains the most common material, but non-PVC alternatives are now being sold because of concerns about the risk in transfer of plasticizers from PVC into food. For food cateringapplications, PVC is the most common. For household use, LDPE is gaining market share because it is purportedly safer. More and more countries over the world are concerned about the environmental effect of PVC, as the material is said to be toxic and harder to recycle. Nevertheless, PVC is still used because its stretching properties offer excellent food catering presentation on the shelf, and it clings well to more kinds of surfaces. Even so, some countries are starting to ban the use of PVC in toys for infants and food contact applications. The original Saran Wrap is made of polyvinylidene chloride (PVdC). In July, 2004 the name Saran Original was changed to Saran Premium and the formulation was changed to low density polyethylene (LDPE). SC Johnson claimed that this change was a result of an initiative to look for more sustainable and environmentally acceptable plastic. The film in Saran Premium Wrap does not contain chlorine. However, LDPE does not possess the same barrier qualities to oxygen, aroma, and flavor molecules that vinylidene chloride copolymers do, making the new formulation a lower quality plastic wrap, as it is not as useful in protecting from spoilage or flavour loss. PVC is not impermeable, but adheres well. LDPE is impermeable but doesn't cling as well. The PVC-based films contain plasticizers, most often bis(2-ethylhexyl) adipate (DEHA), but phthalates (most often dibutyl phthalate (DBP) and bis(2-ethylhexyl) phthalate (DEHP)), in spite of being prohibited in most countries, also cause concern. The plasticizers were found to migrate to some foods, for example cheeses or fatty fish and meat. In the UK, polymerized plasticizers replaced DEHP in this application, largely eliminating the problem. A common alternative to PVC is low density polyethylene (LDPE), which is less clingy than PVC, but also does not contain traces of potentially toxic additives. Newer production processes are closing the clingy gap between PVC and LDPE. 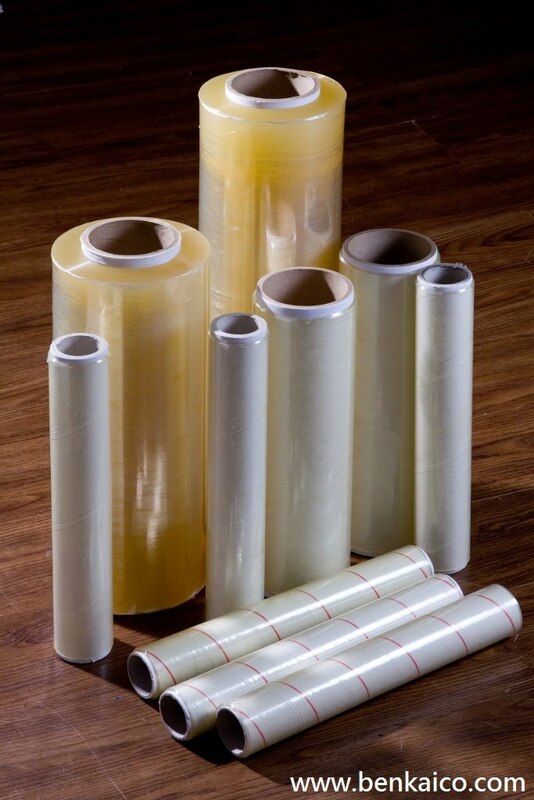 Linear low density polyethylene (LLDPE) is sometimes added to the material, as it increases the clinginess and the tensile strength of the film. Brands like Glad Cling Wrap or Handi-Wrap are LDPE-based. 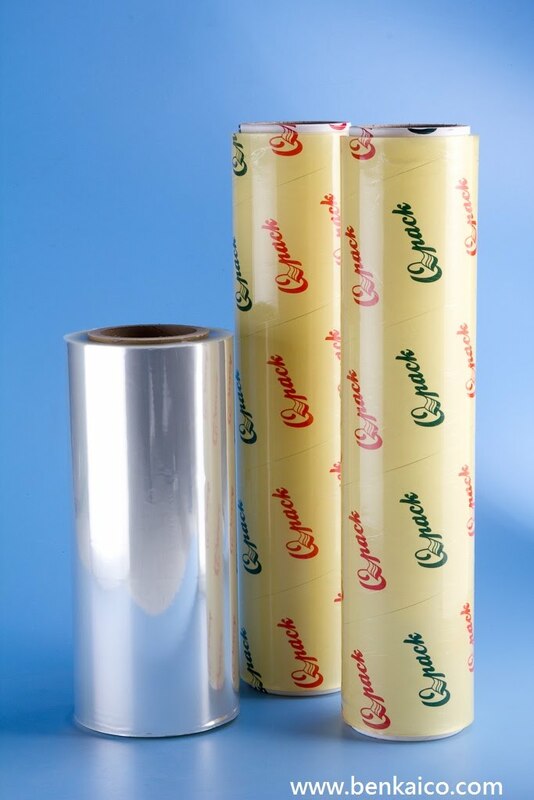 Saran Premium Wrap, a newer version of Saran Wrap, is based on LDPE as well. Glad Press'n Seal has its surface covered by shaped dimples, which hold the adhesive away from the surface. While being handled, the wrap is unsticky, but when pressure is applied the dimples are flattened and the adhesive pushed against the contacting surface, sticking them together.The adhesive used is a special edible type similar to chewing gum. PVdC has better barrier properties than the more-permeable LDPE, making the foods wrapped in it less subject to freezer burn. However, LDPE is substantially cheaper and easier to make. Natural polymers of LDPE and PVdC are insufficiently clingy on their own, and they do not adhere to themselves. To achieve the desired clinginess, certain polymers with lower molecular weight have to be added; the most common two are polyisobutene (PIB), and poly[ethylene-vinylacetate](EVA) copolymer. Their chains readily interact with each other and their lower molecular weight makes them more mobile within the host polymer matrix.